Video: Disowned By Your Family Over Politics? This has to stop. It's eroding the fabric of society. Chairman Devin Nunes attends the CPAC Convention and sat down for a lengthy Question and Answer session to discuss the ongoing investigations into top-tier corruption within the FBI and DOJ. Much of the discussion centers around the abuse of the FISA court system and the politicization of multiple U.S. intelligence agencies. Was the effort to focus America's attention on the idea of “fake news”—itself a propaganda effort? Connect the dots and learn who’s behind it and why. It’s not what you think. Sharyl Attkisson is a five-time Emmy Award winner and recipient of the Edward R. Murrow award for investigative reporting and author of two New York Times bestsellers: “The Smear” and “Stonewalled.” Attkisson hosts the Sunday national TV news program “Full Measure,” which focuses on investigative and accountability reporting. For thirty years, Attkisson was a correspondent and anchor at PBS, CNN and CBS News, where the Washington Post described her as "a persistent voice of news-media skepticism about the government's story.” She’s a fourth degree blackbelt in TaeKwonDo. This talk was given at a TEDx event using the TED conference format but independently organized by a local community. Editor's Note: I can't even believe CNN aired this . . .
Former Democrats express glee at president’s achievements. In an apparent effort to pour scorn on the president’s first year in office, CNN traveled to Youngstown, Ohio to ask former Democrats who switched parties to vote for Trump what they thought of his performance, only to discover they were thrilled with the job Trump’s doing. The report points out that 7,000 registered Democrats in one county switched from being Democrats to Republicans to vote for Donald Trump. One former Democrat featured in the report said he switched because he realized “the core foundation of the country is slipping away”. Another woman remarked, “It got to the point where I did not like the direction my country was going”. Perhaps expecting the five former Democrats to express regret that they switched to vote for Trump, CNN’s Martin Savage asked how Trump was doing one year in. The answers were resounding. Editor's Note: Not that the current form of the Republican Party is worth a crap . . . a little history is very eye opening. The Repukes need to get back to their root values . . . It sometimes happens during hunting season that the quarry suddenly pops its head out of hole, like a whack-a-mole, then finds itself stunned at spotting your red jacket. The alarmed badger or a quick-witted fox ducks back down pronto to dodge the shot, and the hunter's lucky not to blow your own foot off with the shotgun. Investigative journalists have similar unexpected jolts, as happened Sunday afternoon when I was about to pen the first line of this essay which was supposed to start with an ode to women’s softball. Distracted by that false alarm over an ICBM homing in for a second Pearl Harbor attack, I noticed another intriguing news item: “Moby says CIA agents asked him to spread the word about Trump and Russia”. There you have it in a nutshell, the thesis that I’ve been pursuing for more than a year that the dossier was part of a CIA-White House operation. Moby is the nickname of a DJ, Richard Melville Hall, who has an online following of millions of ravers and pogo punks in mosh-pits around the world, the same sort of young and restless rebels who flocked to Soros-funded protests against the Trump inauguration. Say, bro’, those friends of yours are violating congressional rules on the strict separation of foreign intelligence and domestic affairs. Like, psst . . . we got a job for you to do at a book depository in Dallas. That’s sort of, uh illegal, Moby, especially if you get caught or let it slip like you just did, because now a DA can squeeze the identities of those CIA agents out of you with a court order. Squeeze, like, you’re toothpaste, dude. Those CIA creeps truly got imagination, since Trump never set foot inside a brainwashing camp in North Korea. Hey, come to think of it, wasn’t it the CIA that created Manchurian Candidates, like inside Ewen Cameron’s psychiatric ward? Jason Bourne, MK-ULTRA. Thanks for the tip-off about your CIA pals creeping around like succubi in short skirts in a dark disco. After expressing these harsh warnings, I should apologize to you, great white whale of vegan animal-rights, for that comparison to a wide-eyed badger. To tell the truth I never liked killing animals, not after doing the dirty work at a testing lab and sending thousands of pathetic chickens to be plucked and boiled at a Campbell’s Soup factory. Hunting was just an excuse to walk around inside private forestland, and the only gunshots fired were to scare off a few noisy crows disturbing the peace and quiet. Those were just a nature walk in the woods without harming a single feather on a quail, Moby, so don’t go reporting me as a gun-toting terrorist to your CIA handlers. Relax, have a carrot. Now that they know you squawked, next time you see them just smile and nod while they palm off their Afghan heroin to the drugged-out teens and zonked bankers on the dance floor. Since you’ve spilled the beans, you’d better pray the Agency boys don’t do another Bataclan or an Orlando Pulse like at one of your performances. The most striking aspect of the Senate Judiciary inquiry of witness Glenn Simpson, boss of the Fusion GPS front-man who supposedly produced and distributed the Trump-Russia Dosser, is how Sen. Dianne Fienstein’s legal counsel inexplicably avoided any significant disclosures from him. With every opportunity to further discredit the Trump team, the Democratic counsel Heather Sawyer eschewed serious probing of Simpson over Russiagate and relented whenever he shied away from answering. If this had been a court trial of a serial killer, he would have been home for dinner with all night to reload. Her turn to interview the witness followed a superb display of incisive questioning from Grassley legal staffer Patrick Davis, who got Simpson to disclose his paid work against the 2012 Magnitsky Act trade sanctions for Russian lawyer Natalia Veselitskaya, prior to and after her notorious meeting at Trump Tower with Don Jr., Paul Manafort and Jared Kushner. Despite the fact that a Senate inquiry lacks powers of prosecution, Davis and his team sweated out Simpson to admit that he acted as a bloodhound, tactician and publicist for Kremlin-linked interests against the Magnitsky Act sanctions and its top proponent William Browder, CEO of Hermitage Capital, the employer of auditor Sergei Magnitsky, who died in a Moscow prison. Displaying passive-aggressive, even sadistic pleasure in catching up with his prey, Simpson boasted about how he tracked down Browder to an unannounced appearance at the Aspen Institute and had two of his employees serve him subpoenas, only to watch Browder toss the papers on the parking lot and drive away in fury. (p.40-43) The emotional confrontation with Browder revealed a streak of fanaticism in Simpson’s pursuit of a termination to sanctions on Russia. This is especially disturbing when considering that his ethically challenged client Prevezon owner Denis Katsyv had to pay $5.9 million in fines to the U.S. Treasury in May 2017 for money-laundering funds gained through tax evasion in Russia. Last things first, meaning that this article must lead off with a look at why Sen. Dianne Feinstein released, without authorization, an online file of the transcript from the Senate Judiciary closed-door hearing of August 22 on Fusion GPS, the research team that produced the Trump-Russia Dossier. This first installment analyzing the Senate Judiciary transcript, augmented with background information, is the opener for the can of worms involving Fusion GPS in Russian intrigue. Hold your breath! A detailed look at the many themes probed by the Senate legal counsels will continue in upcoming articles in this series, including the rogues’ gallery of suspect Russian businessmen influencing U.S. politics; Russian mafia-linked players who have infiltrated the U.S. real estate market; the spy who loved money more than truth Christopher Steele; and miscellaneous curiosities, all with a cautionary warning: Don’t look for good guys here, because they’re all crooks. First off, examined here, is the transcript’s revelation of Fusion GPS’s very own Russiagate, which points to the strong possibility of the Russia dossier being, from its inception, a cynical forgery fabricated to implicate candidate Trump (in a clever ploy to extend Kremlin influence over the Democrats). An astonishing fact is that Fusion GPS was hired by Natalia Veselitskaya, the notorious journalist who lobbied for an end sanctions on Russia. The timing is significant because her contract with Fusion GSP began two months prior to her (in)famous meeting with Trump’s trio of advisers, which was the nub of the Russiagate scandal. That was a set-up from the start. From June until October 2017, Russian agent Veselitskaya’s relationship with Fusion GPS overlapped simultaneously with the Trump-Russia Dossier contract for the Hillary campaign, a situation much too close for comfort. The dossier contract, arranged just a month prior to the Democratic National Convention, indicates that Simpson was possibly involved in collusion with DOJ-FBI-CIA officials to exercise control over the nomination process of both parties, and only later to set up an entrapment scheme against candidate Trump to prevent populist control of the executive branch. When the mysterious deaths of Seth Rich and Shawn Lucas are taken into account, several lines of investigation point in the same direction toward gross interference by the Deep State in the democratic electoral process. The transcript of the judicial hearings is a complex text that requires close perceptive reading to distill not just the facts presented and various stratagems by Glenn Simpson and his lawyers to avoid self-incriminating disclosures, but more importantly key missing pieces in the Trump-Russia Dossier puzzle that are not mentioned, including who exactly negotiated the Hillary campaign’s contract with Fusion GPS, now that Donna Brazile has denied any DNC involvement. 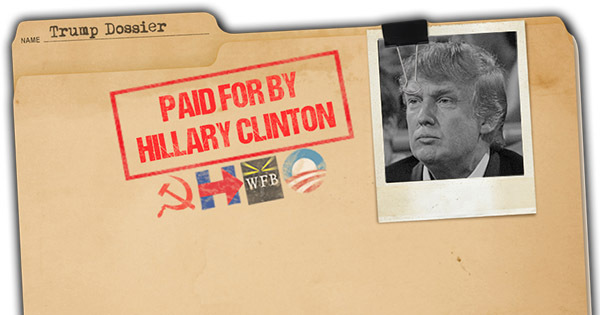 What tantalizing information was on offer to seal the Fusion GPS deal with the Dems, along with how much was paid by Hillary campaign and who signed the check for Fusion GPS? Upon discovery of these still-hidden residuals, arrest warrants can be issued since libelous forgery with an intent to blackmail or harm a presidential candidate is a felony with a mandatory prison sentence. In this particular case, the involvement of a known Kremlin agent means the second count is treason. Sorry, Mr. Bannon, it's not Donny who's implicated. The treason belongs to Glenn Simpson and some yet-to be identified individuals in the Hillary Clinton campaign. Her public release of the transcript more than five months after the Senate Judiciary hearing could not have been some impulsive act or precipitated by a lapse of judgment due to sinus congestion. Her headache indicated that Feinstein had come to the realization she had disclosed too much in her initial statement that “I just got pressured”. So let’s prescribe a capsule, a hot cup of lemon tea, a dose of truthfulness and a pair of handcuffs. To “get pressured”, passive tense, indicates that some other individual(s) actively urged Feinstein to release the transcript, which she must have passed around for review by her advisers without Senate committee approval. Her casual violation of national security precautions are reminiscent of Hillary Clinton’s carelessness with her private server, which is unacceptable for a former chair of Senate Intelligence and senior minority member in the Judiciary Committee. Oh, those dizzy dames! What is most intriguing in the Senate Judiciary transcript are the highly damaging revelations about the Democratic Party’s connections via Fusion GPS to the Russian lobbyist who (in)famously met with Don Trump Jr., Paul Manafort and Jared Kushner. Since the hidden Dem-Russia connection was related to the Kremlin campaign to end the Magnitsky Act sanctions, the Democrats’ Jewish donor base should be downright angry at the collusion between DNC-Hillary relationship with Glenn Simpson and his Fusion GPS crew, who were paid by Russian journalist Natalia Veselnitskaya on behalf of Prevezon Holdings, the money-laundering company implicated in the arrest and death in prison of crusading accountant Sergei Magnitsky. The timeline of events discussed in the transcript indicates something much more important and secretive was going on between the Dems and Fusion GPS than the pretext of opposition research on the then “unelectable” Trump, i.e. a secret pact toward an agreement with the Kremlin to end Magnitsky Act sanctions against Russia following Hillary Clinton’s anticipated electoral victory. Revival of trade with Russia would mean billions in profits for her corporate supporters. Before proceeding into the Feinstein intervention, one observation must be laid out: the Hillary-influenced State Department and the CIA were probably aboard the sanctions-killing deal, but the counterintelligence bureaucracy needed to be sucked into the secret agreement. That would explain the role of the Department of Justice officials, Bruce Ohr, his superiors and wife Nellie, all of them being connected with Fusion GPS through the DOJ-friendly Main Justice blog run by Simpson’s wife Mary Jacoby, a blood relative of top executives at the Clintons’ longtime patrons with Stephens Inc.
"The American People Deserve the Whole Story"
Senator Grassley is one of the few truly honest people in Congress . . . This is an epic and important speech.